A dip made with chickpeas, sesame seed paste, red chilli purée and spices. Chickpeas and tahini blended with cumin, coriander and turmeric. Cooked Chickpeas (52%), Water, Tahini Sesame Seed Paste, Rapeseed Oil, Onion, Concentrated Lemon Juice, Sultanas, Red Chilli Purée, Salt, Garlic, Garlic Purée, Coriander, Cumin Powder, Coriander Powder, Turmeric Powder, Cumin Seed, Cinnamon Powder, Ginger Powder, Cardamom Powder, Nutmeg. Cooked Chickpeas contain: Water, Chickpeas. Not suitable for home freezing., Keep refrigerated. 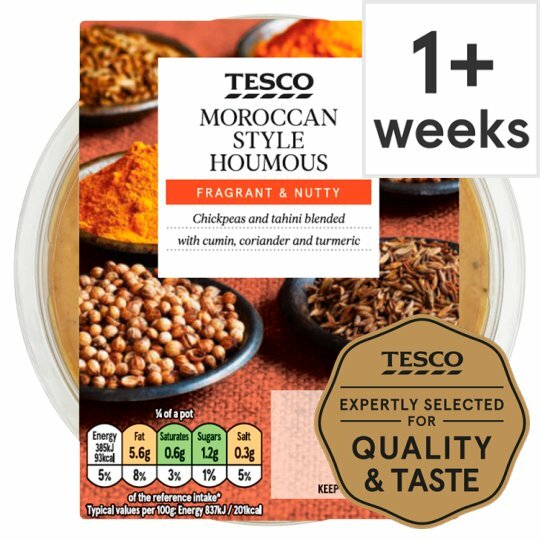 Once opened, consume within 2 days and by 'use by' date shown.